You are in absolute luck if you happen to have some leftover Greek-style Paleo meatballs in your fridge… If your stars are not quite that aligned, well, then you are just going to have to start from scratch, which is not such a bad event when all things are considered. Why? 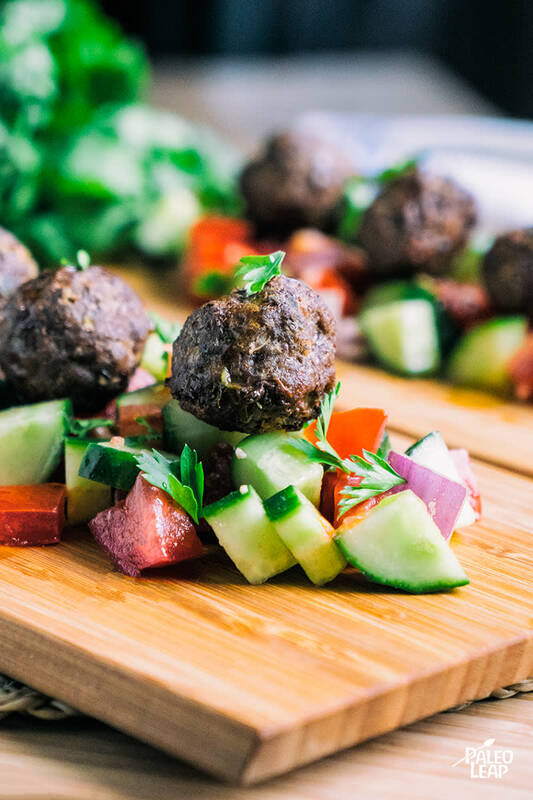 Because these meatballs are awesomely flavorful with notes of mint, oregano, coriander, cumin, cinnamon and nutmeg – anything store bought just won’t do! They are also baked, not fried, so they save you from cleaning up little grease splatters all over the stove top. Ready to get started? Today it is your choice of ground beef or lamb. Mix the glorious amount of spices and herbs into the meat, then form little bite-sized balls by hand and place them on a baking sheet. It is important to remember not to compact them, otherwise they will get tough and rubbery, they may even choose to roll off the salad, and we don’t want that! Speaking of the salad, you’ll also want to chop your colorful vegetables into bite-size pieces, and put all your love into the olive oil and red wine vinegar salad dressing. Trust us, cooking from the heart, always makes your digestion happy. This salad stands alone, though if you are feeding more people or you are really hungry and think it needs a companion, you can deftly prepare a batch of deviled eggs with bacon to serve on the side, completing the meal while your meatballs are browning nicely in the oven. In a salad bowl combine all the vegetables for the Greek salad. Whisk together the olive oil, red wine vinegar, lemon juice, oregano, parsley, garlic, and season to taste. Pour the dressing over the salad and mix until well combined, refrigerate until ready to eat. In a bowl combine all the ingredients for the meatballs and mix until everything is blended together. Form the meat into bite-sized meatballs with your hands and place on a baking sheet. Bake in the oven 15 to 20 minutes, or until no longer pink in the middle. Serve the salad topped with the meatballs and fresh parsley.